Community foundation donor advised funds allow you to benefit immediately from reduced income tax obligations, and perhaps a reduced tax bracket, while allowing yourself the necessary time to give thoughtful consideration to your charitable goals. An immediate income tax deduction for the current market value of assets contributed to your donor advised fund (a better tax deduction than may be available with a private foundation). No capital gain tax on contributions of appreciated assets. There are significant advantages to contributing appreciated assets to charity (stocks, bonds, real estate, closely-held stock). When you contribute these types of assets to your fund, you can deduct their fair market value without incurring any capital gains liability – so you can have more available for your grant making. Any income or growth of assets within a donor advised fund is not subject to tax. Donor advised fund assets are not subject to estate taxes. A contribution to community foundation separates the tax event from the grant-making event, eliminating year-end pressures to make decisions about which charities to support. You can make contributions to community foundation at any time, and then decide – when you are ready – which charities will receive the funds. Community foundation urges donors to consult their attorneys, accountants or tax advisors with questions relating to deductibility of various types of contributions to community foundation donor advised funds for federal and state tax purposes. Indianola raised $14 million to accomplish its vision of designing and building the B.B. King Museum and Delta Interpretive Center. Including the cotton gin where B.B. King worked as a young man, the museum takes advantage of Northwest Mississippi’s asset as birthplace of the Blues and outstanding musicians. In its first six years, the Indianola museum has told its story to over 30,000 visitors from all 50 states and over 35 countries. To keep serving these visitors and reaching out to the community, the museum needs operating funds for staff, programs, and maintenance every year. 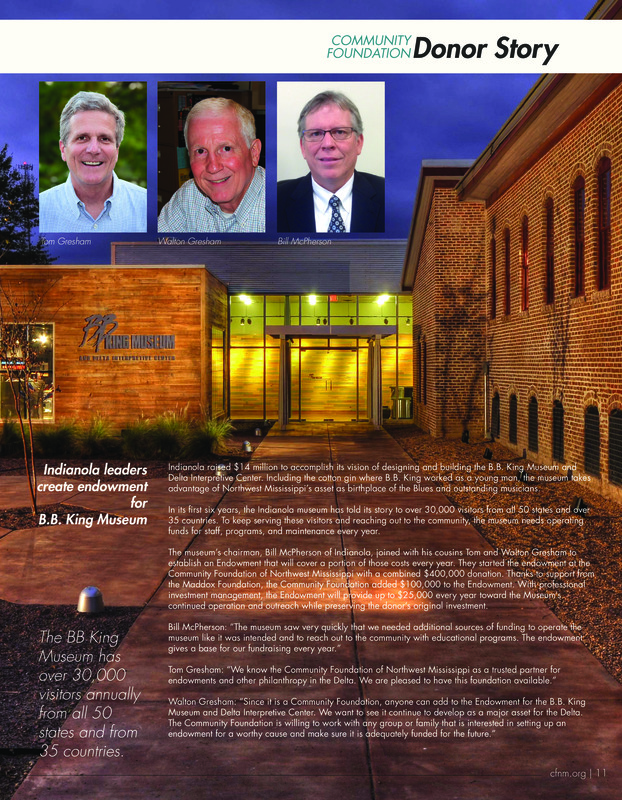 The museum’s chairman, Bill McPherson of Indianola, joined with his cousins Tom and Walton Gresham to establish an Endowment that will cover a portion of those costs every year. They started the endowment at the Community Foundation of Northwest Mississippi with a combined $400,000 donation. Thanks to support from the Maddox Foundation, the Community Foundation added $100,000 to the Endowment. With professional investment management, the Endowment will provide up to $25,000 every year toward the Museum’s continued operation and outreach while preserving the donor’s original investment.